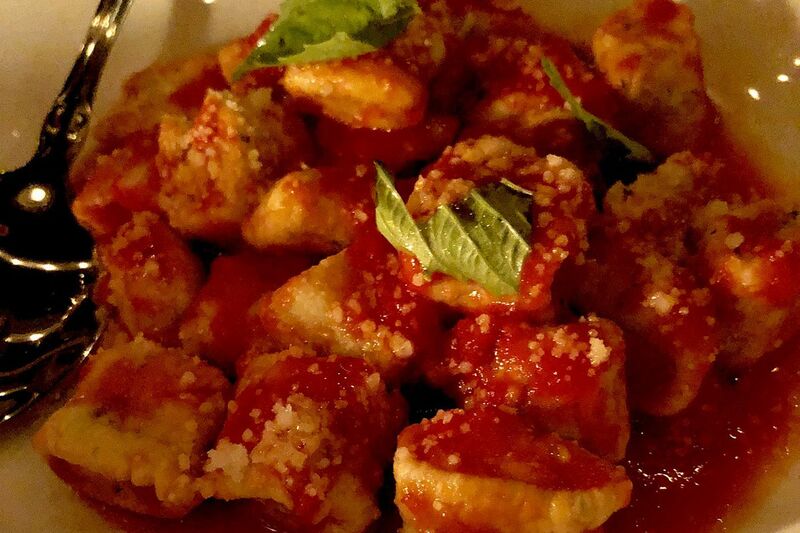 Gnocchi at Giuseppe & Sons, 1523 Sansom St. This week marks what most likely is 2018′s splashiest opening: Giuseppe & Sons, the long-awaited partnership of Michael Schulson and the Termini Bros. pastry family — savory and sweet, spread over two floors of a long-vacant Center City building. Also this week, I show off a cute breakfast-luncher in Delco and a charming bar in Kensington. If you need food news, click here and follow me on Twitter and Instagram. Email tips, suggestions, and questions here. If someone forwarded you this newsletter and you like what you’re reading, sign up here to get it free every week. How to follow up Harp & Crown, one of the restaurant hits of 2016? Chef-restaurateur Michael Schulson and wife Nina Tinari went next door to 1523 Sansom St. with Giuseppe & Sons, in a partnership with Vincent Termini Sr. and sons Joe and Vinny of South Philly's Termini Bros., the pastry guys. But it's more than just the sweet side of Termini. Vince Senior has a savory past. A decade ago, the home cook opened a side project, Mr. Joe's Cafe, across from the bakery on Eighth Street near Tasker. Giuseppe & Sons' menu, overseen by chef Wesley Fields and corporate chef Leo Forneas, is studded with renditions of Vince's bold Sicilian stylings. It's actually two restaurants in one. At street level, through a revolving door, is an Italian luncheonette selling sandwiches, salads, and baked goods from 11 to 3. At night, the fun comes out. Step downstairs into the basement, traverse a narrow hallway lined with old photos, and step into supper club with multiple seating options: at the marble bar, beside the bar in a comfy sofa, in the more public sunken dining room, along the perimeter in a banquette with a special someone, or smack in the middle at Table 99, which was packed last night with a fun-loving party of 10. There's plenty of energy, abetted by a peppy, Geater-y '60s-'70s soundtrack, while the lighting is romantically but un-Instagrammatically low. In one of my more enjoyable assignments over the summer, I dropped in on a few menu experiments. Fields and crew hit the right red-gravy notes - tender meatballs; braised octopus with cannellini beans that get a zing from chili peppers; pillowy, light gnocchi with basil and San Marzano tomatoes. Chef Jeff Michaud at Osteria (now part of the Schulson empire) contributed the tomato pie, served in strips as an appetizer. Best deal is the $55 tasting — basically a sampler of the menu: two appetizers, a salad, a side, a pasta, and one dish from the chicken/veal/fish section, which features our old friends the Parms, the Milaneses, and the Fra Diavolos, among other dishes. Though you get a cannoli after dinner, do not skip a hunk of banana cream pie. More substantial dinner options include a la carte proteins such as strip steak, pork chop, veal chop, and Dover sole. Dinner starts at 5 p.m. and wraps at 10 Sunday to Tuesday, 11 Wednesday and Thursday, and midnight Friday and Saturday. Bar stays open two hours after. Chef Chatayee "Venus" Kapugthong's plush Thai bar-restaurant at 1227 Walnut St. is in its soft-opening phase. The soul-fooder has shut down its storefront; it's doing catering pending the opening of a Philly location in 2019. The chain's remaining Philly-area locations, in Northeast Philadelphia and Morrisville, are kaput. Early warning: The pie cafe has announced that its last day will be Dec. 23. Dec. 2 is the official closing date of the Fourth and South Streets store, as well as the store at 4415 Main St. in Manayunk. Breakfast tacos at Mission Taqueria, 1516 Sansom St.
Sam Mink at the Oyster House looked back on his years in San Francisco for inspiration to create this bright, modern taqueria that replaced the Nodding Head brewpub upstairs. Mission can get loud over dinner, but the weekend brunch patrons aren't necessarily stopping in for copious tequilas and foosball. That means you get a civilized experience (the full bar includes margs and other cocktails) as well as tortillas made from house-ground masa, breakfast tacos, regular tacos, burritos, and the substantial chilaquiles verdes topped with two sunny-side-up eggs. Plus churros for the kids. Substitutions are no problem; the kitchen swapped in chorizo for the bacon on the breakfast tacos (scrambled eggs, queso fresco, grilled scallion relish, hot sauce) you see here. Chicken and waffles at Tank & Libby's in Drexel Hill. Barely a week ago, two chefs/longtime friends (Alex “Tank” Reid and Joe “Libby” Libertore) opened this cheery, family-run bruncherie in Pilgrim Gardens shopping center (the address belies its location on Township Line Road). It greets the morning daily at 7 with La Colombe coffee and a full-on, served-all-day breakfast menu of hearty stuff, including omelets/frittatas, Benedicts, French toast, and the chicken and waffles you see before you. The chicken is skinless and ever-so-lightly breaded, and — stay calm now — the waffles are made with bits of bacon inside the batter. Lunch (similarly big-portioned salads and sandwiches) starts at 11 a.m. It wraps at 2:30. Open-face meat loaf sandwich at Sutton's in Kensington. Fergie's alum Niall Murphy is onto something special at his chill, welcoming industrial-looking bar in fast-rising Kensington, two doors from St. Benjamin's Brewing Co. and a few blocks from the Fishtown hubbub. Over more than a year, he gutted an old deli, installing a zinc bar beneath brand-new timbers and brick walls, festooning the walls with photos and maps harking back to the area's industrial past. Full bar includes 12 draft lines — 10 beer, a cocktail, and a wine. Chef Katie Murphy delivers a small but effective menu, satisfying fried-food snack-lovers (fried pickles, curry cauliflower, tots), vegans (a pulled "port" sandwich made of portabella mushroom) as well as those seeking substance (an open-face meat loaf sandwich with caramelized tomato jam, crispy Brussels sprouts, and gravy on house-made potato bread). It’s open at 4 p.m. daily. Philly’s newest members-only dining club, Tasting Collective, creates $50, six-course deals and an ‘anti-Yelp’ rating system to help chefs. An avocado growers’ strike has caused prices to skyrocket. Restaurants citywide have been impacted. Advent calendars can be more than just pictures: This year’s crop includes some with candy, tea and even alcohol. See some of our picks. Reader: Nice feature last week on the chicken shawarma sandwich at the Al Amana Grocery. How did you ever find that? Craig LaBan: Thanks! I heard good things about Al Amana (1501 Germantown Ave.) from people who work in the neighborhood and went to check it out myself — and wasn’t disappointed. It’s truly a hidden gem, tucked inside a little grocery at the back of a mosque in Kensington. But I’m not surprised it was great. In fact, some of my favorite international restaurants happen to be located inside markets. You can’t beat the access to fresh ingredients. And you also know that they are cooking for a crowd that appreciates both genuine flavors and affordable prices. Here are a bunch of others. Not far away at the Liberty Choice Market (1939 N. Front St.) in Kensington, a Middle Eastern grill in the back cooks one of my favorite falafel sandwiches, but also a tasty aromatic chicken tawook kebab. One of my all-time favorite finds in Chinatown is Tasty Place (143 N. 11th St.), which isn’t just tucked away at the back of an Asian supermarket — it’s in a market that’s hidden underground at the southeast corner of 11th and Race Streets. It’s worth the trip down those stairs to this humble, brightly lit nook for some of the best salt-baked chicken wings anywhere, wok-fired chow fun (get it “dry”), and some surprisingly delicate fish dishes. There are several excellent restaurants hidden among the covered arcade hallways of the Vietnamese supermarkets on Washington Avenue. Huong Tram (1601 Washington Ave.) is little-known because of its obscure location, down the central hallway of an Asian market complex just west of Broad, but it’s one of my go-to spots for very good pho and a broad menu of Vietnamese classics. On the east side of Broad, there are a number of other great pho halls tucked beside markets, too, but the place I’m thinking of now is actually a very good Indonesian restaurant inside Wing Phat Plaza called Sky Café (1122 Washington Ave.), which makes outstanding lamb satay and nasi bungkus rice bundle packed inside a banana leaf with fragrant beef rendang. Not far away, on the southeast corner of Ninth and Washington, you can taste old-school Italian flavors at Anastasi Seafood (1101 S. Ninth St.), a 10-table restaurant specializing in fresh fish and pasta that’s wrapped by glass walls that separate it from a seafood market — at least for the next month. The seafood market is expected to move into a larger space on the north side of Washington sometime before the new year. In West Philly, one of my favorite Indian restaurants can be found behind the gold curtain that separates the aisles of basmati, dal and curry pastes at Dana Mandi (4211 Chestnut St.) from a communal seating area, where international students gather around some of the hottest Punjabi flavors in town and watch Bollywood pics on the big-screen TV. If you like Korean food, meanwhile, both the Elkins Park and Upper Darby locations for the H-Mart supermarket chain are renowned for food courts where you can get your fix of everything from soondubu soft tofu stews to dumplings, pajun pancakes, and sushi. Meanwhile, the region’s only dedicated Japanese market, Maido! (5 Lancaster Ave., Ardmore) on the Main Line, happens to have a handsome lunch counter where they serve the best okonomiyaki seafood pancakes, gyudon beef stew and katsu chicken with curried gravy. True Japanese comfort food! They always say never shop hungry. The restaurant-inside-the-market phenomenon, I think, is the ultimate solution.